Welcome to the 3rd annual Philly Pressbox Radio Roundtable Hall of Fame voting ballot. As a review in 2014 we elected the following players. Chuck Bednarik, Steve VanBuren and Reggie White of the Eagles. Mike Schmidt, Steve Carlton and Robin Roberts of the Phillies. Bobby Clarke and Bernie Parent of the Flyers and Wilt Chamberlain and Julius “Dr J” Erving of the 76ers. In 2015 we allowed the fans to select the top 3 by voting. Each fan could vote for 5 plauyers with the top 3 being inducted. Jim “Chet” Chesko and Bill Furman each selected one player. The fans selected Brian Dawkins, Richie Ashburn and Bill Barber while Chet selected Smokin Joe Frazier and Bill selected Pete Pihos. We have added 5 new players to the ballot to combine with the 11 holdovers. Your job is to select 5 from the list. The ballot will close before next weeks show where we will announce our 5 new members. So far the fans and the Philly Pressbox Radio staff have gotten it right. Lets see how 2016 goes. In June of 2014 Jim “Chet” Chesko and Bill Furman along with the listeners of Philly Pressbox Radio selected the first ever Philly Pressbox Hall of Fame class. There were 21 Philadelphia athletes, all members of their respective Hall of Fame, that were put on the ballot, of that 10 were selected. They were Mike Schmidt, Steve Carlton, Robin Roberts of the Phillies, Wilt Chamberlain and Julius “Dr J” Erving of the 76ers, Bobby Clarke and Bernie Parent of the Flyers and Chuck Bednarik, Steve Van Buren and Reggie White of the Eagles. The remaining 11 from that ballot were carried over to 2015 and we’ve added 5 more names to the list. Of the 16 on the 2015 ballot the fans will vote to pick 3, Chet will pick one and Bill will pick one for a total of 5 to complete the class. Each person can make a maximum of 5 picks since this list is so tough. 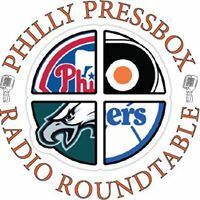 The voting will be open until Wednesday June 17 with the results announced during the Philly Pressbox Radio Roundtable show at 7pm Eastern time on June 17. As a follow-up to the Philly Pressbox Radio Roundtable show which aired live on Wednesday May 28, 2014 we have established our voting poll below. You can listen to the show at http://www.blogtalkradio.com/phillypressboxradio and here Jim “Chet” Chesko and Bill Furman break down each of the 21 finalists. The finalists were selected based on the fact that they have already been inducted in to their respective Halls of Fame. Many others were consider, some led Philadelphia teams to championships, however, they didn’t make this cut due to not having the longevity in the city. Believe me selecting just 10 out of the 21 will be difficult enough. There are some others that may be inducted in to their Hall of Fame in the future but they to were left off at this time. We have 5 Phillies, Mike Schmidt, Steve Carlton, Robin Roberts, Richie Ashburn and Jim Bunning. There are 6 Eagles, Steve Van Buren, Chuck Bednarik, Pete Pihos, Tommy McDonald, Bob Brown and Reggie White. We have 4 Flyers, Bobby Clarke, Bernie Parent, Bill Barber, Mark Howe and 6- 76ers, Wilt Chamberlain, Hal Greer, Billy Cunningham, Chet Walker, Julius Erving and Charles Barkley. Feel free to vote on our poll below and also feel free to leave comments by clicking the “reply” tab below. Philly Pressbox Radio would like to recognize our loyal sponsor Shop for Kisses, the on-line shopping network of the Kisses for Kyle Foundation. Please visit their website at http://www.shopforkisses.org. With every purchase you make you earn cash back and each purchase helps the KFK Foundation which helps Delaware Valley families dealing with childhood cancer.